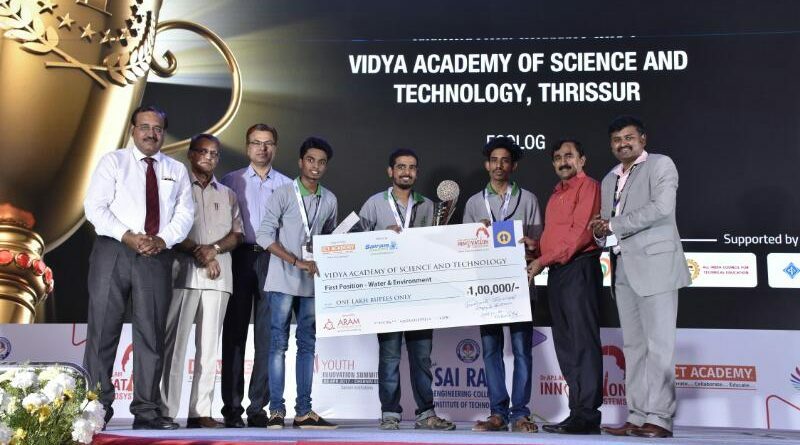 Dr. APJ Abdul Kalam Innovation Ecosystem 2017 is a CSR initiative of Sri Sairam Engineering College and ICT Academy aimed at encouraging and inspiring students across India to show their Engineering knowledge in several fields such as Agriculture, Energy, Water & Environment, Manufacturing & Technology and Infrastructure. Dr. APJ Abdul Kalam Innovation Ecosystem 2017 organized a National Level Project Competition across India on 8th and 9th April 2017. The submitted projects were evaluated by eminent jury headed by Shri. 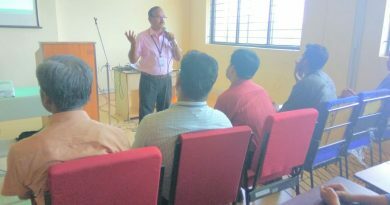 Ponraj Vellaichamy, Scientist and Technical Advisor to Former President of India Dr. APJ Abdul Kalam.Sarath Sasikumar, Sethu E P and Athul P S won first prize with cash award of one lakh under the “WATER and ENVIRONMENT Category” for the project ECOLOg- Recycle paper pen and semi automated machinery. Sarath Sasikumar is the founder of “ECOLOg” start-up company under IEDC, VAST. Other cofounders are Sethu E P, Mervvin Joshy and Sandra C Rajendran. They have been running this unit in coordination with more than 20 students from ECE (major) and CE. Sarath had started the idea of recycle pen innovation during his +2 study in school. Later after joining Vidya, he got an idea for the development of first prototype pen. Under the coordination of ED club during the year 2015, he and his team started the development of recycle paper pen and provided trainings based on its production. When ED CLUB was converted to IEDC, ECOLOg got a boost for the further development of the recycle pen, its semi automatic machinery and marketing of the product within and outside the college. During Feb 2017 for the Dr. APJ ABDUL KALAM INNOVATION ECOSYSTEM AWARDS 2017;Prof. Swapana E V M, IEDC Nodal Officer , shared the information about the event and they applied. Dr. APJ ABDUL KALAM INNOVATION ECOSYSTEM AWARDS 2017 received around 1200 entries on 5 different categories. Among the 1200 reports, 100 innovative ideas were selected for the final round. In the final round, 20 teams competed in the Water and Environment category. On 8th April 2017, they presented the semi- prototype machine of recycle pen and even showed the samples of the pen along with their presentation. This project was finally selected by the Jury . 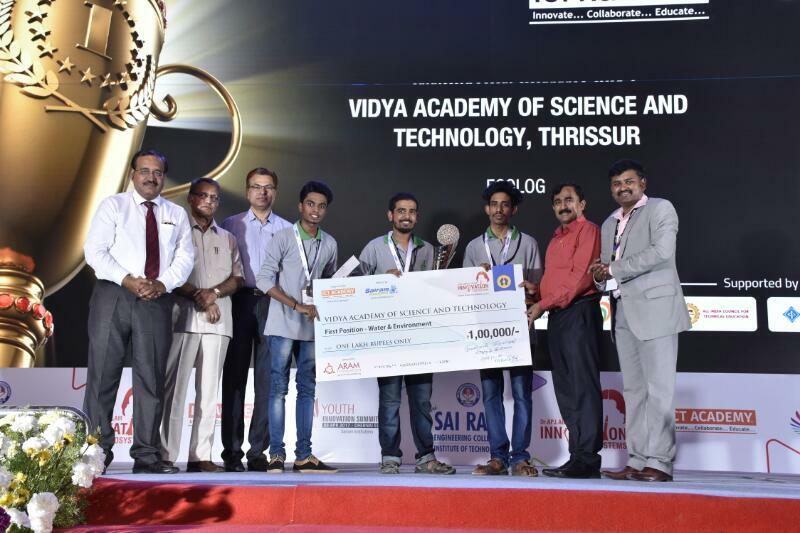 Sarath Sasikumar, Sethu E P and Athul P S was awarded First prize in the Water and Environment category and got a cash award of Rs 1 lakh. Next ECOLOg is going to develop an automated recycling paper pen machine and various other ECO friendly products and machinery. They were there also! NSS volunteers helped organise Aascharya 2018! February 14, 2018 Anil M Comments Off on They were there also! 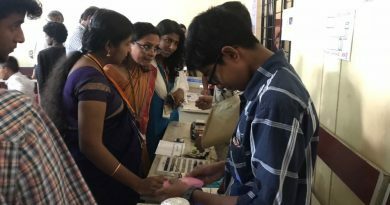 NSS volunteers helped organise Aascharya 2018!